Tree removal for the sake of upgrading urban parks has been a touchy subject in recent weeks as both Moncton and Fredericton grapple with vocal opposition. About 200 trees will be removed from Centennial Park as the City of Moncton begins construction on a multimillion-dollar project to replace a pool and expand parking. The contractor has begun clearing a section of the park where the new Centennial Beach pool will be built, replacing the aging facility that's at the end of its useful life, said Dan Hicks, the city's director of parks and leisure services. He said the city understands there will be concerns about tree removal in an urban setting. "Unfortunately, in this case, it is a reality. We can't build a pool in a forest without having to remove some trees," he said. "It's kind of like making an omelette; you have to break a few eggs, but at the end of the day, hopefully you end up with the result you're looking for." The project calls for the planting of about 130 new trees, several bushes, planting beds and a rain garden that will help divert stormwater. Hicks said the city has taken measures to avoid removing more trees — measures like planned underground stormwater storage systems instead of detention ponds. "The number of trees that are being cut is being kept to an absolute minimum," he said. The new facility will consist of a pool, seating and shaded areas, senior-friendly amenities, accessible features, 14 washrooms and a storage area. The zero-entry wading pool will be able to accommodate 651 bathers. The Centennial Beach will be built in a new spot on higher ground that will improve public access and make the facility more visible within the community, Hicks said. 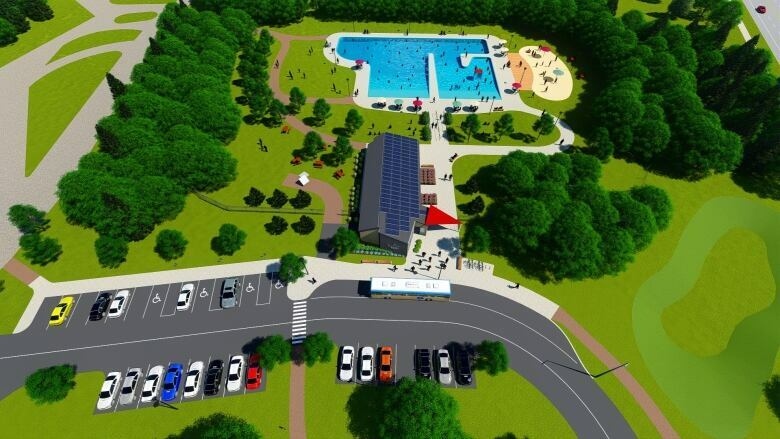 The pool's new location within the park will no longer have access to the current parking lot, and so the parking area that exists on St. George Boulevard, near Dickson Boulevard, will be expanded. That's where the entrance to the facility will be. The $3.5-million project is set to be completed and open in June 2019. The fate of less than two dozen trees at another Moncton park and one in downtown Fredericton has caused a stir in both cities with municipal officials taking some heat. Moncton is planning an upgrade of Aberdeen Park that includes removing 16 trees as well as berms in the area and adding more light to make the park safer. And protests were held at Officers' Square in Fredericton to save 19 trees scheduled to be cut down.